The Maine Warden Service graduated eight new game wardens at the Maine Criminal Justice Academy in Vassalboro Thursday, Aug. 30. 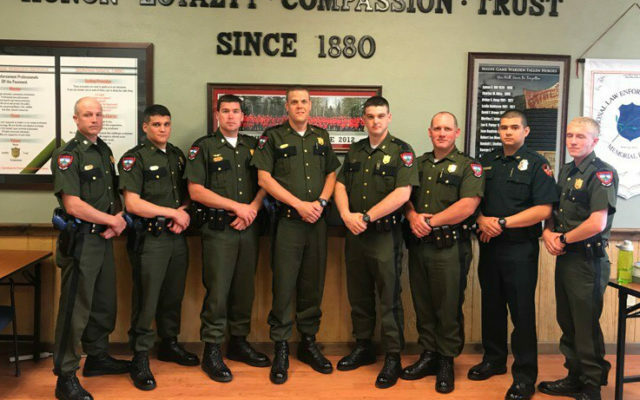 VASSALBORO, Maine — The Maine Warden Service graduated eight new game wardens at the Maine Criminal Justice Academy in Vassalboro Thursday, Aug. 30. Seven of these game wardens work for the Maine Warden Service and one is a Penobscot Tribal Game Warden. All eight wardens recently completed an extensive 13-week advanced academy focused specifically on game warden work. The Advanced Warden Academy followed the 18-week Basic Law Enforcement Training Program required of all full-time Maine police officers. “The past 13 weeks prepared the new game wardens by utilizing classroom, field and scenario based training components,” said Cpl. John MacDonald of the Bureau of Warden Service. Critical aspects of game warden work includes search and rescue, recreational vehicle crash investigation, snowmobiling, water survival, white water navigation, physical fitness, mechanics of arrest, public relations, and bureau policies and procedures are among the many topics of training covered. Speaking before the class were Maine Department of Inland Fisheries and Wildlife Commissioner Chandler Woodcock, Maine Warden Service Colonel Joel Wilkinson, Warden Service Chaplain Kate Braestrup, Warden Service Captain Shon Theriault, class speaker Game Warden Tyler Leach and keynote speaker Retired Game Warden Supervisor John Crabtree.